During the summer of 2014 sixteen science teachers from all around the Great Lakes region spent a week on board the U.S. E.P.A ship R/V Lake Guardian on Lake Erie as part of the Shipboard and Shoreline Science Workshop. Sponsored by the Center for Great Lakes Literacy, Ohio Sea Grant, Pennsylvania Sea Grant, and the U. S. Environmental Protection Agency, teachers were connected with scientists in first hand explorations of the ecology, geology, and bio-geochemical processes of Lake Erie. Although I knew the experience on the R/V Guardian was going to be amazing, I never dreamed that the workshop would have such an impact on my students. Towards the beginning of the school year my class spends a lot of time learning about the importance of qualitative and quantitative observation. This year my students were able to apply their understanding of metric measurement while learning about the Great Lakes. Students were engaged in an activity where they had to use yarn to outline, label, and organize the shorelines of the Great Lakes to scale. After graphing the shoreline metric distances, students compared the total shoreline distances of the Great Lakes to the U.S. shoreline along the Atlantic Ocean, Pacific Ocean, and the Gulf of Mexico. 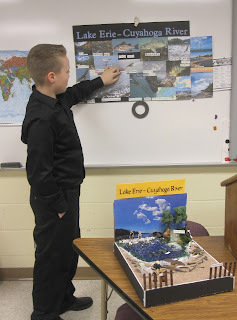 Students then compared and contrasted the size of the Great Lakes to the total volume of water each lake holds, the metric mass of commercial fish caught, and the human population surrounding each Great Lake. This activity enabled me to reinforce the importance of metric measurement as we used metric rulers, triple-beam balances, and graduated cylinders in class. This also set the stage for in-depth discussion of the Great Lakes and the problems they face. As the year progressed, students learned more about the Great Lakes, and specifically the Lake Erie watershed that they live in. Students learned about research that scientists aboard the R/V Guardian were completing. Research included a study of native and invasive species by Ruth Briland of The Ohio State University, a study of the presence of plastics by Sam Mason from State University of New York, and a study of chemicals and E. coli bacteria by Steve Mauro from Gannon University. This led to a better understanding of the importance of water quality. 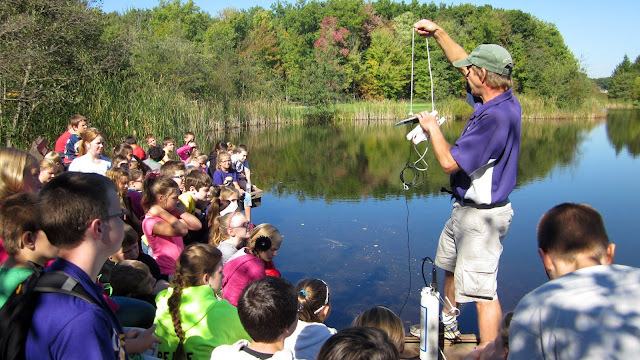 Macro-invertebrate studies and the use of water quality monitoring equipment lent for use by the U.S. Environmental Protection Agency allowed real-world application as students studied water in local tributaries of the Lake Erie watershed. 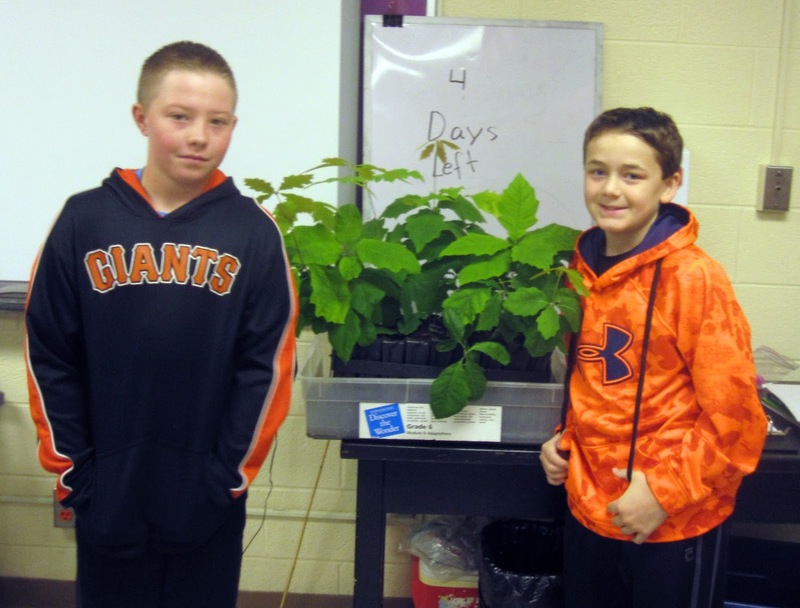 Follow-up allowed students to complete individual in-depth research related to invasive species of the Great Lakes. This information was presented with the use of visual projects such as PowerPoint, dioramas, or posters in class. 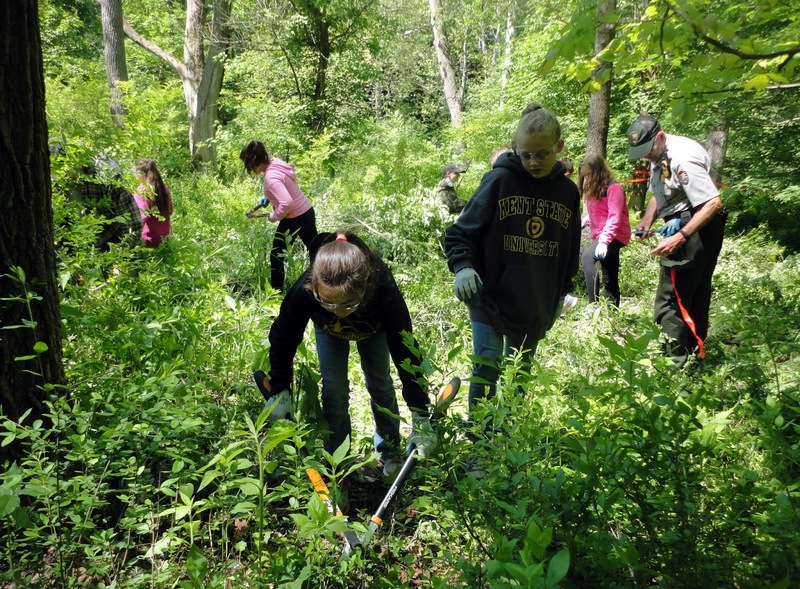 problem in the Cuyahoga River watershed, invasive species are now the real concern. In culmination, with the help of high school horticulture students from the Trumbull County Technical and Career Center and park rangers from the Cuyahoga Valley National Park, my students learned teamwork as they used gloves, eye protection, and loppers supplied by the national park to cut and stack the invasive plants along the river bank. National park employees later use controlled use of herbicides on the stumps to kill the plants. What an amazing year!